Feb 19, 2013 Vancouver B.C. 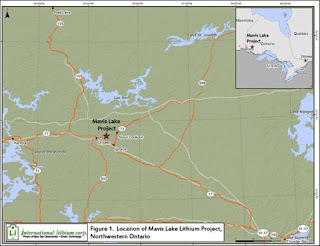 February 19, 2013: International Lithium Corp. ("ILC" or the "Company") (ILC: TSX-V) is pleased to announce lithium and associated rare metal assay results from the first eleven (11) holes of the Company's recent drill program on the pegmatite field spanning the Company's contiguous Mavis Lake and Fairservice claims near Dryden, Ontario. Assays are pending for the remaining 8 holes. "In addition to the assay results, we report observing a wide alteration halo surrounding and between the pegmatites containing a lithium bearing mineral holmquistite. This halo is strikingly wider than expected and indicates the possibility of a larger, undiscovered pegmatite body at depth. The next phase of the exploration program will be designed to develop drill targets for testing this model. This new data, supported by a review of historical geophysical and lithogeochemical surveys has changed our targeting from shallow mineralization to more substantial targets at depth" comments John Harrop, VP Exploration. Holmquistite is a lithium mineral found in rocks hosting lithium bearing pegmatites, immediately adjacent to contacts with the pegmatites. Holmquistite is a valuable exploration indicator towards the discovery of hidden Lithium rich pegmatites. Typically, holmquistite is found within a few metres from the pegmatite contact, but on the Property it is observed up to 10s of metres from the pegmatite contacts. This exceptionally wide alteration suggests that the substantial volume of lithium, which permeated the rocks, may derive from a larger, deeper pegmatite body or pegmatite system than has yet to be discovered. The objective of the 19 hole, 2,075 metre drill program carried out on the Fairservice/Mavis Lake project from November to December in 2012 was to continue testing the subsurface continuity along strike and down dip of significant pegmatite intersections from historical and 2011 drilling. Extensive structural, geological, geochemical and geophysical interpretation of both new and historical data was utilized to co-ordinate drilling this year and to better interpret the orientation and distribution of pegmatite bodies for this and future exploration programs. * All widths reported are drill core widths and have not been converted into true width. Within the Mavis Lake pegmatite field, significant mineral and metal zonation indicates its highly evolved history. As a result, significant values for metals of interest are often in adjacent zones with limited overlap, which prevents a simple table of results. The majority of these holes were oriented perpendicular to the surface trace of mapped pegmatites on the property. New information from this drilling program indicates that many individual pegmatites have a more variable dip to the north than was previous realized. Consequently, most of the holes were drilled south. Several bands of pegmatites cross the Property, but only one band, the Central band, has a significant number of outcrops and has been the target of the majority of both the Company's and historical drilling. The Northern Band of pegmatites, approximately 100m north of the Central Band, was targeted in five drill holes during this campaign following up on the 2011 discovery hole, drill hole MF11-12, that intersected 28.45 metres grading 1.22 %Li2O and 26.25 metres grading 1.86 %Li2O. Holes MF12-21, 22 and re-entered hole MF11-15a targeted the Northern Band near the extensive MF11-12 intersection. Hole MF12-24, targeting over 25m east of the wide pegmatite intersections of MF11-12, drilled through a well mineralized pegmatite containing 1.51% Li2O over 21.40m including 2.37% Li2O over 9.20m. The vertical drill hole MF11-15 was re-entered (named MF11-15a) and the hole extended an additional 70.3 metres to 175.3 metres depth to test revised models of pegmatite orientation. Pegmatites encountered tended to be significant in tantalum values but less so in lithium, further adding to the understanding of lithium-tantalum zonation on the Property. Hole MF12-25 was drilled more than 25m to the west of MF11-12 from the north and also contains a well-developed core zone of spodumene and quartz with 1.51% Li2O over 6.0m. Holes MF12-24 and 25 were drilled approximately 250m to the west, adjacent to the only reported pegmatite outcroppings along the Northern Band and on section to an historical hole from 1956, B-7, that contained 0.917% Li2O over 9.20m. Hole MF12-22 targeted the shallow up dip direction of the pegmatite intersected in B-7 and encountered narrow and less mineralized pegmatites. Hole MF12-21 intersected 1.31% Li2O over 3.70m and occurs below MF12-22 and above the historical B-7 intersection indicating thickening at depth on this section of the Northern Band and may represent the lateral continuity of the well-mineralized pegmatites in MF11-12, MF12-24 and MF12-25 250m to the east. The presence of well evolved chemistry, significant high-grade intersections, apparent thickening at depth and extensive and unrivalled holmquistite alteration halos indicate a sizable pegmatite or pegmatite system at depth. The remaining six holes targeted the central band of pegmatites. Hole MF12-28, drilled 25 meters east of MF11-11, collared in a shallow, high grade pegmatite with 2.53% Li2O over 6.0m with the pegmatite open toward the east. Hole MF12-27 was drilled under an historical lithogeochemical lithium in host rock anomaly. The pegmatite intersected had significant tantalum values, but the wall rocks contained more lithium than the pegmatite itself, suggesting the hole did not test deep enough to identify a pegmatite source related to the surface geochemical anomaly. Hole MF12-30 tested pegmatite infill at depth between previously drilled outcrops on the central band. Laboratory work was conducted by Activation Laboratories Ltd of Ancaster, Ontario with the samples being submitted by Company staff to their Dryden prep facilities. Activation Laboratories is an accredited laboratory with ISO 17025:2005 and CAN-P-1579 certification. Analysis was conducted using a sodium peroxide fusion followed by ICP-MS. The Company uses industry recognized practices to ensure quality control. To support this, a number of large samples were collected from surface sites known to have significant lithium and tantalum values. Following preliminary analysis a blend of these samples is being used to develop a certified reference material matrix matched to the Companies pegmatite projects. The new reference material has been inserted into the sample stream at the Property and will be utilized on other Company projects. strongly peraluminous Ghost Lake Pluton and related pegmatitic granite dykes. Rare metal mineralization in the Mavis Lake area occurs in zoned pegmatites hosted by mafic metavolcanic rocks. Rare metal mineralization occurs in four zones: internal beryl zone within the parent of the Ghost Lake pluton that evolves to the east within the Fairservice and Mavis Lake claim blocks into external zones of beryl-columbite, spodumene-beryl-tantalite and albite-type pegmatites. John Harrop, P.Geo, FGS, is the company's qualified person on the project as required under NI 43-101 and has reviewed the technical information contained in this press release. International Lithium Corp. is an exploration company with an outstanding portfolio of projects, strong management ownership, robust financial support and a strategic partner and keystone investor Jiangxi Ganfeng Lithium Co. Ltd., a leading China based lithium product manufacturer. The Company's primary focus is the Mariana lithium-potash brine project in Argentina within the renowned South American 'Lithium Belt' that is host to the vast majority of global lithium resources, reserves and production. The 160 square kilometre Mariana project strategically encompasses an entire mineral rich evaporite basin that ranks as one of the more prospective salars, or 'salt lakes' in the region. Complementing the Company's lithium brine projects are rare metals pegmatite properties in Canada and Ireland that have revealed through recent highly positive results a clear potential that the Company will advance with the support of its strategic partner, Ganfeng Lithium. These projects can add distinct value as the Company strives to source rare metals to help meet the increasing demand through the growth in global technologies that utilize the rare metals suite of elements. 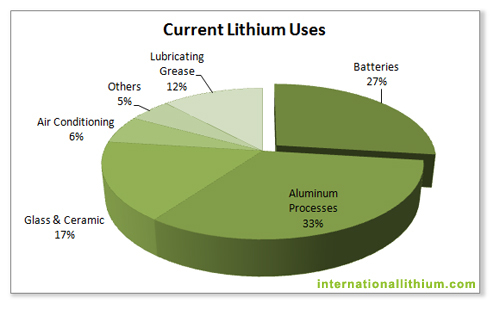 With the increasing demand of high tech applications in battery and vehicle propulsion technologies, lithium and other rare metals are no doubt the metals of tomorrow's green tech economy. By positioning itself with solid development partners and projects with significant resource potential, ILC aims to be the green tech resource developer of choice for investors and build value for its shareholders. 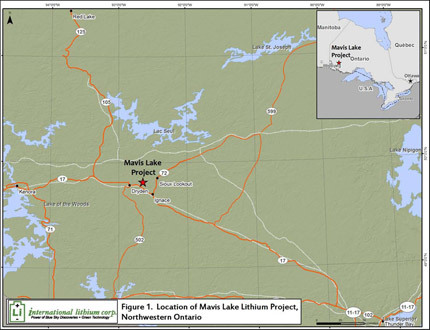 International Lithium Corp.'s mission is to find, explore and develop projects that have the potential to become world-class lithium, potash and rare metal deposits.